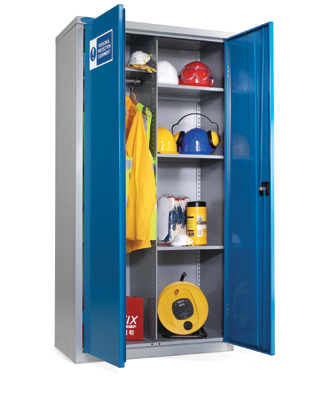 A PPE combined wardrobe and cabinet for the storage of personal protection equipment, supplied with blue doors and BS5499-1 labelling. With a central partition, one side has 3 adjustable shelves and the other has a single shelf with hanging rail. 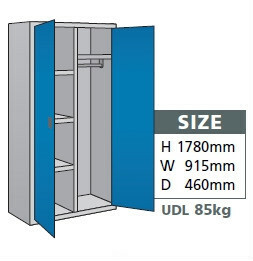 This is the ideal cabinet for the storage of protective clothing, garments, high visibility jackets, hard hats and boots, with secure locking doors.